Planning and building the pens for peafowl is one of the most important tasks that peafowl breeders will face as their flock size grows. The pens should provide plenty of space for the peafowl to breed and to coexist without being overcrowded. Pens should provide security from both air borne and ground based predators. Properly designed pens can keep peafowl healthy by preventing feral birds from entering the pens and transmitting diseases to the peafowl. Feral birds can also eat a lot of peafowl feed when flocks descend on poorly designed pens. Injuries to peafowl and their owners can be avoided by designing the pens so that the peafowl can be sorted and relocated without having to catch the birds in a net or cage. The purpose of this article is to share many of the ideas that we have incorporated in to our twelve, new flight pens. Please see the enclosed drawing of our flight pens to find dimensions and details our design work. I have raised animals and birds all my life and these experiences have helped me to design our flight pens to allow for easy handling and sorting of birds without having to catch them. If you have ever attended a livestock auction in person you will have seen that the animals are moved by a series of gates and aisle ways. We have incorporated this idea in to our flight pens by making an 8’ wide aisle way that runs the entire width of our flight pens. The end gate of each flight pen opens in to this aisle way and will swing open a full 90 degrees. This allows for birds to be driven in to the aisle way for sorting or moving to a new pen without being caught. The aisle way also serves as a security feature as well by providing a second enclosure that the birds would have to escape from in order to get away in to the wild. This idea is taken from zoos that have large aviaries for birds that humans can enter and interact with the birds. There are always 2 doors or gates that the people have to go through in order to enter or exit the aviary. Gates are positioned at each end of the aisle way and in the middle to provide maximum access for grass mowing, landscaping equipment, and etc. The aisle way gates swing out so that if a bird were to ever escape, they could be driven back in to the aisle way with ease as long as they were on the ground. Small swinging gates are used in each pen to allow us to access each pen with out having to walk through the entire length of each pen or having to walk through the box stalls. These gates can also be used to move birds from pen to pen. The wooden structure of our pens is built on standard 8’ on center construction. This method was chosen so that the pens match up identically in width to the heated box stalls on the inside of our pole barn. The box stalls are 8’ wide, 8’ deep, and 8’ high. The outside, flight pens are 8’ wide, 42’ long, and on average, 8’ high. 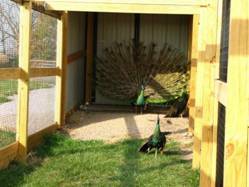 We will keep pairs or trios of our breeder peafowl in each pen. 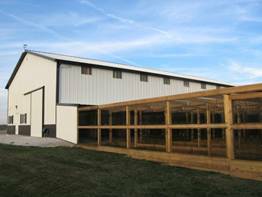 Our pens are built on the south side of our pole barn to provide maximum shelter from the cold, northwest, winter, winds and to take advantage of any winter sunshine. The first 10’ of the pens, leading away from the pole barn, are covered with metal, siding that matches our pole barn. This provides a covered resting area for the birds and provides protection to the box stall entry doors from wind, rain, and snow. All of the lumber used in our flight pens is pressure treated by a new process called Micronized Copper Quaternary (MCQ). 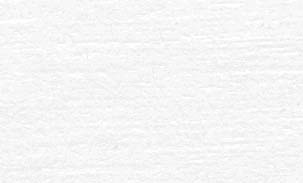 The advantages of this new process are that the lumber is natural colored, environmentally friendly, causes less corrosion of fasteners, and meets all code requirements. 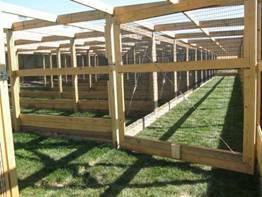 The tops of our flight pens are covered with 1” knotted, Nylon, game bird netting. This type of netting was chosen for its durability, flexibility, and appearance. The 1” netting will be prevent feral birds from entering the pens and will prevent peafowl from becoming entangled when they fly up in to it. Knotted netting is smaller in diameter than knitted netting so it won’t collect as much snow and become weighted down during the winter months. We purchased a 50’ x 100’ panel of netting for our pens so that there are no seams or splices. The sides of our flight pens are covered with PVC coated welded wire. This wire is corrosion resistant and will maintain its nice appearance for the life of the pens. PVC coated wire can be quite expensive. We were able to save about 40% off of the price of the wire by purchasing factory seconds. The wire quality and PVC coating are the same as factory firsts but there is normally a minor manufacturing defect in each roll that off grades the entire roll. Most of the time, the defect was so minor that we easily made a small patch or were able to plan around the defect and cut it out of the roll as we used the wire. The perimeter sides of the pens are covered with 1” x 1” wire to prevent feral birds and small predators from being able to enter the pens. The interior pen sides are covered with 1” x 2” wire. Since the top and exterior sides are feral bird proof, money was saved by using the 1” x 2” wire on the interior sides. A pneumatic stapler was used to attach all of the wire to the pens. The galvanized staples were 1 ¼” in length and with a ½” crown. The staples were spaced about 8” to 10” apart. The perimeter of the pens is protected from digging predators by burying 1” x 2” wire under ground. An electric fence wire is added mid height of the pen sides to prevent any predators from climbing up the sides to try to chew through the top netting. Many of the design ideas incorporated in our flight pens were gathered during visits to fellow peafowl breeders’ farms, visits to zoos across the US , and livestock auctions attended. No matter where you go, ideas can be observed and documented for future use. A digital camera is an invaluable tool for documenting new ideas. Some of the best ideas that I have seen in person have been during the farm visit days of the annual UPA, Inc. conventions held each fall. Our pens were built primarily for our peafowl but the design features used will also allow us to house our East African Crowned Cranes, Cape Barren geese, pheasants and almost any kind of bird that requires heated winter quarters and secure outside flight pens.